The customary picture of the WWII era in California usually focuses on Japanese-American internment. Not to take away from that, the war had an impact on every group of Californians in every part of the state. Recollections of activities, emotions, and devastation experienced by real people on and since August 6, 1945. They tell their heart-breaking stories to make a point... that it must never happen again! CBI - China: Day 120 of 142 of the 1st Battle of Hebei. Germany: The Mormon Church in Germany discontinues its Boy Scout program to oblige the Nazi regime. All former Scouts are forced to join the state-mandated Hitler Youth. Spain: Day 288 of 985 of the Spanish Civil War. The Spanish Nationalist battleship ESPANA sinks after hitting a mine off Cape Penas near Santander during the blockade of Bilbao. Spain: Day 653 of 985 of the Spanish Civil War. CBI - China: Day 298 of 2,987 of the 2nd Sino-Japanese War. Day 83 of 124 of the Battle of Henan. Day 38 of 39 of the Battle of Xuzhou. Japanese troops are poised to capture the city of Xuzhou. 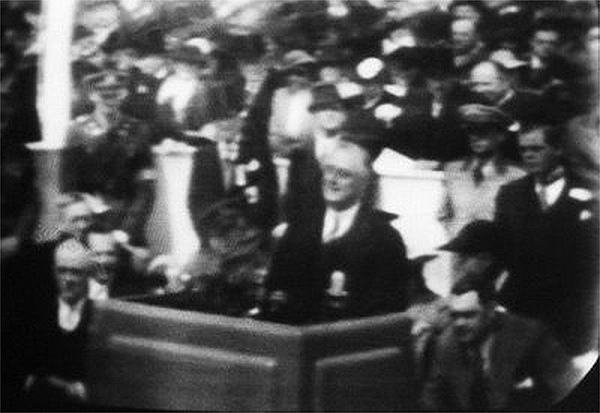 USA: President Roosevelt's speech at the opening ceremonies of the New York World's Fair is broadcast to a handful of television sets around New York, making FDR the first president to appear on television. Some 200,000 people in were in attendance that day as FDR gave a speech extolling the virtues of American ingenuity, thus became the first US president to be broadcast to a television audience. But very few people were able to actually watch the broadcast, as consumer television sets were virtually nonexistent. NBC had scattered a few dozen of the new-fangled television sets throughout New York City in a publicity stunt, but it was still a novelty that would take years to be developed. World War II would halt further development, although some military uses would be pursued, in particular RCA's research into TV guided missiles. Germany: A new law is passed in preparation to move Jewish families into buildings and neighborhoods reserved for them. CBI - China: Day 663 of 2,987 of the 2nd Sino-Japanese War. Day 45 of 54 of the Battle of Nanchang. Day 11 of 35 of the Battle of Suizao. USA: In the Cooper River off Charleston, South Carolina, firefighters from the US Navy Sixth Naval District fight a fire that had broken out on the Norwegian tanker WILLY, which was carrying a load of aviation gasoline. Atlantic: At Greenock, Scotland, the French destroyer MAILLE BREEZE suffers an accidental detonation of two of her torpedoes in the forward section of the ship and sinks. 25 men are killed while 48 others are wounded. Atlantic: British minesweeper HMS DUNDOON hits a mine at Smith's Knoll near Great Yarmouth and sinks, killing 27. Atlantic: Near Namsos, Norway, Luftwaffe JU-87s hit the British anti-submarine sloop HMS BITTERN, killing 20. The crew scuttles the HMS BITTERN to prevent its capture. Off Trondheim, the Luftwaffe sinks the British trawler HMS WARWICKSHIRE, which was later raised by the Germans and put into service. ETO - Norway: Day 22 of 63 of the Battle of Norway. German and British troops clash near Dombås. The RAF bombs the Stavanger and Fornebu airfields near Oslo. Germany: The first guarded Jewish ghetto is established at Lodz, Poland. Later it will be sealed off with 230,000 Jews inside. CBI - China: Day 1,029 of 2,987 of the 2nd Sino-Japanese War. Day 168 of 381 of the Battle of South Guangxi. Atlantic: German sub U-107 sinks the British ship LASSELL 300 miles southwest of Cape Verde Islands. Atlantic: Four old US Coast Guard Cutters are commissioned into the British Royal Navy service at New York. They are christened the HMS BANFF, HMS CULVER, HMS FISHGUARD and HMS HARTLAND. ETO - UK: Day 237 of 258 of the Blitz. Casualty figures for the month of April are 6,065 killed and 6,926 injured. MTO - Malta: The Luftwaffe bombs Malta. One bomb passes clean through the British cruiser HMS GLOUCESTER without detonating. MTO - Greece: Day 25 of 25 of the Battle of Greece. All of Greece is now under German and Italian occupation. MTO - Libya: Day 21 of 256 of the Siege of Tobruk. The Germans begin a 24 hour shelling on Tobruk. MTO: British gunboats HMS APHIS and HMS LADYBIRD bombard the Axis positions at Gazala, Libya and Sollum, Egypt. Middle East: 6,000 Iraqi troops with 30 artillery pieces leave Baghdad and go to a plateau overlooking the RAF airbase at Habbaniya. East Africa: Day 325 of 537 of Italy's East African campaign in the lands south of Egypt. CBI - China: Day 1,394 of 2,987 of the 2nd Sino-Japanese War. CBI - Thailand: Day 212 of 221 of the Franco-Thai War (Vichy France vs Thailand). Atlantic: Day 107 of 169 of Germany's Second "Happy Time," during which U-boats sink 609 Allied ships with little risk. U-456 damages the HMS EDINBURGH in the Norwegian Sea. ETO - Germany: Hitler and Mussolini meet at Berchtesgaden in southern Germany to discuss a Mediterranean strategy. This is the eleventh of their fourteen meetings. Priority is given to thwarting Allied operations by capturing the Suez Canal and neutralizing Malta. Russian Front - North: Day 235 of 872 of the Siege of Leningrad. Russian Front - North: Day 82 of 102 of the Battle of the Demyansk Pocket, another failed attempt to break the siege at Leningrad. Russian Front - North: Day 98 of 103 of the Battle of the Kholm Pocket. Another attempt to break the siege at Leningrad. Russian Front - South: Day 183 of 248 of the Siege of Sevastopol, Crimean Peninsula. CBI - Burma: Day 138 of 164 of Japan's Invasion of Burma. Chinese troops destroy the bridge at Ava as they fall back. Further north, Japanese troops capture Lasio cutting off the supply route into China. The British 1st Burma Corps completes its withdrawal over the Irrawaddy at Mandalay. CBI - China: Day 1,759 of 2,987 of the 2nd Sino-Japanese War. PTO - Malaya: Day 71 of 357 of the Battle of Timor Island. PTO - New Guinea: US 5th Air Force P-39s attack parked Japanese airplanes and fuel dumps at Lae and Salamaua. PTO - Philippines: Day 144 of 152 of the 1st Battle of the Philippines. A US Navy PBY Catalina evacuates some personnel from Corregidor. ETO - Spain: Operation MINCEMEAT: The body of Glyndwr Michael is put to the sea from the British sub HMS SERAPH off Huelva. 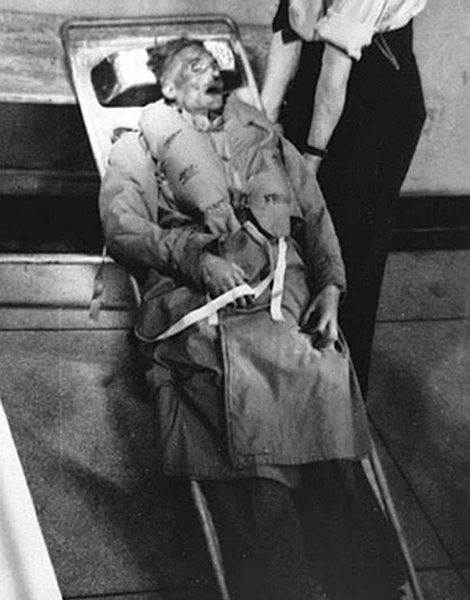 The corpse is posed as "Major William Martin" with false "top secret" documents intended to mislead the Germans of an upcoming invasion of Greece. The corpse of Glyndwr Michael posed as "Major Martin"
2010 TV movie "Operation Mincemeat"
In the early hours of 30 April, HMS SERAPH surfaced a mile off the coast of Spain, near the port of Huelva. The British knew that there was an Abwehr agent in Huelva who was very friendly with the Spanish officials there. Lieutenant Norman Jewell and his officers gently launched the body and briefcase into the water. Jewell read the 39th Psalm, although no burial service was specified in the orders. Half a mile to the south, a rubber dinghy was thrown overboard to provide additional "evidence" of a crash. The canister that had carried the corpse from Scotland was taken further out to sea and riddled with machine gun fire so that it would sink. Jewell then radioed the signal "MINCEMEAT completed" while the submarine continued to Gibraltar. The body is found at around 9:30 am by a local fisherman and is taken to Huelva by local military and law enforcement. It is quickly reported to the Abwehr agent in Huelva, Adolf Clauss, operating under the cover of an agriculture technician. Atlantic: The Bermuda Conference between the US and UK ends. Discussions included the question of Jewish refugees liberated by Allied forces and those still remaining in Nazi-occupied Europe. The only concrete conclusion is that the war must be won against the Nazis. Germany: The construction of the Bergen-Belsen Concentration Camp in northwestern Germany begins. Russian Front - North: Day 600 of 872 of the Siege of Leningrad. Russian Front - North: Day 361 of 658 of the Siege of the Kholm Pocket. MTO - Tunisia: Day 165 of 178 of the Battle of Tunisia. RAF and US Air Forces provide Allied air support. Day 4 of 5 of the Battle of Hill 609. CBI - Burma: US 10th Air Force B-25s bomb the Gokteik Viaduct and the Maymyo railroad yards. B-24s bomb the Sule Pagoda wharves at Rangoon. CBI - China: Day 2,124 of 2,987 of the 2nd Sino-Japanese War. PTO - Alaska: Day 328 of 435 of the Battle of Kiska, Aleutian Islands. US 11th Air Force attacks targets at Kiska. PTO - Japan: The USS SCORPION sinks the Japanese patrol ship EBISU MARU No 5 with a torpedo. PTO - New Guinea: Day 9 of 148 of the 2nd Battle of Lae-Salamaua. 5th Air Force provides air support. PTO - Solomon Islands: US 13th Air Force B-17s bomb the Kahili Airfield. ETO - France: US 8th Air Force B-17s and B-24s bomb airfields and V-weapon sites. ETO - France: US 9th Air Force B-26s and A-20s attack V-weapon construction works and marshalling yards. Russian Front - North: Day 89 of 191 of the Battle of the Narva Isthmus, Estonia. Both German and Soviet troops remain in their defensive positions. Russian Front - South: Day 23 of 35 of the Battle of the Crimea. Russian Front - South: Day 23 of 60 of the Battle of Romania, 1st Jassy Offensive. MTO - Italy: Day 105 of 123 of the Battle of Monte Cassino. RAF and US Air Forces provide air support. The German Gustav Line continues getting weaker. MTO - Italy: Day 100 of 136 of the Battle of Anzio. RAF and US Air Forces provide air support. CBI - Burma: Day 57 of 166 of the UK's Operation THURSDAY. CBI - Burma: Day 52 of 147 of the Battle of Myitkyina. US 10th Air Force provides air support. Merrill's Marauders continue an advance on Myitkyina. CBI - Burma: Day 30 of 302 of the Chinese Salween Offensive. US 14th Air Force provides air support. CBI - China: Day 2,490 of 2,987 of the 2nd Sino-Japanese War. Day 14 of 259 of Japan's Operation ICHI-GO. Day 14 of 39 of the Battle of Central Henan, the first offensive in Japan's Operation ICHI-GO. Chinese continue retreating from central China. CBI - India: Day 54 of 118 of the Battle of Imphal-Kohima. CBI - Indochina: US 14th Air Force P-40s knock out a bridge near Dong Mo. PTO - Marshall Islands: The US 7th Air Force bombs Jaluit Atoll and Ponape Island. PTO - New Guinea: Day 62 of 80 of the Battle of the Admiralty Islands. 5th Air Force provides air support. PTO - New Guinea: Day 138 of 597 of the Battle of New Britain. US 13th Air Force provides air support. PTO - New Guinea: Day 9 of 481 of the Battle of Western New Guinea. PTO - Solomon Islands: Day 182 of 295 of the Battle of the Bougainville Islands. US 13th Air Force provides air support. ETO - Norway: Norwegian troops capture Finnmark. ETO - France: Day 275 of 284 of the Battle of Brittany. ETO - France: Day 228 of 236 of the Siege of Dunkirk. ETO - Germany: American-born British propagandist William Joyce, nicknamed "Lord Haw Haw," makes his final broadcast for the Nazis in Hamburg shortly before it is overrun by British troops. Joyce escapes, but will be captured on 28 May 45 and hanged for treason on 03 Jan 46. ETO - Germany: The Soviets and US 1st Army link up near Ellenburg. ETO - Germany: The British 2nd Army liberates 20,000 POWs from Sandbostel while the US 3rd Army frees over 100,000 POWs near Moosburg. Hey, my dad was one of them! Germany: The recently married Adolf Hitler and Eva Braun commit suicide in Berlin. Their bodies are burned near the Chancellery bunker. Russian Front - Center: Day 198 of 206 of the Battle of the Courland Pocket in Latvia. Russian Front - Center: Day 15 of 23 of the Battle of Settin-Rostock, both sides of the border between Germany and Poland. Day 8 of the 11-day Battle of Bautzen. Russian Front - Center: Day 15 of 17 of the Battle of Berlin. Russian Front - Center: Day 77 of 83 of the German Siege of Breslau (today Wroclaw, Poland). The 4th Ukrainian Front captures Moravska Ostrava. Russian Front - Center: Day 6 of 8 of the Battle of Halbe, Germany. MTO - Italy: Day 25 of 27 of Operation GRAPESHOT. US 5th Army links up with French forces near the French-Italian border. The Allies launch a successful offensive in northern Italy. The Allied Air Forces provide air support. CBI - Burma: Day 86 of 99 of the Battle of Pakokku and Irrawaddy River operations in central Burma. Anglo-Indian troops gain a beachhead on the Pegu River. CBI - Burma: Day 6 of 12 of the Battle of Rangoon. US 10th Air Force provides air support. CBI - China: Day 2,855 of 2,987 of the 2nd Sino-Japanese War. Day 30 of 91 of the Battle of Zhijiang. US 14th Air Force provides air support. Day 22 of 60 of the Battle of West Hunan (near Zhijiang). The USS TREPANG sinks the MIHO MARU in the Yellow Sea. PTO - Caroline Islands: US 7th Air Force bombs the airfields on Moen and Param Islands in Truk Atoll. PTO - Formosa: US 5th Air Force B-24s bomb at Toshien, Tainan, Takao and Okayama while B-25s hit Taito. PTO - Japan: US 20th Air Force B-29s bomb the Tachikawa air depot, the airfields at Kokubu, Oita, Tomitaka, Saeki and Kanoya, and the city of Hamamatsu. PTO - Japan: Day 30 of 83 of the Battle of Okinawa. PTO - New Guinea: Day 490 of 597 of the Battle of New Britain. US 10th Air Force provides air support. PTO - New Guinea: Day 374 of 481 of the Battle of Western New Guinea. US 10th Air Force provides air support. PTO - Philippines: Day 193 of 299 of the 2nd Battle of the Philippines, aka the Liberation of the Philippines or the Philippines Campaign. PTO - Philippines: Day 137 of 244 of the Battle of Luzon. 5th Air Force provides air support. The Mexican Air Force 201st Squadron arrives at Manila. During the war, they will fly 96 combat missions. This is the only Mexican unit to see overseas combat in their nation's history. PTO - Philippines: Day 52 of 159 of the Battle of Mindanao Island. 5th Air Force provides air support. PTO - Philippines: Day 44 of 135 of the Battle of the Visayas region. US 5th and 7th Air Forces provide air support. At age 14, a farm boy from Rigby, Idaho, Philo T Farnsworth dreamed of trapping light in an empty jar and transmitting it, one line at a time, on a magnetically deflected beam of electrons.